One would think that a gracious woman would be the kind of person to write a series called, The Grace Challenge, right? Yeah, I’d think that, too, but, instead you get me. Quite frankly, I’m the last person on earth that should be writing this series because I don’t feel qualified to do so! I know me, and I know I’m not gracious enough because sin abounds in this heart of mine. My husband asked me a few weeks back what project I was working on for the blog, so I told him about this series. Initially, he thought I was collaborating with other bloggers on this project because he didn’t understand why I was doing this. I told him this series was something I was doing on my own for the next several weeks, and then he asked me why. So, friend of mine, I’ll be challenged with you in this series which means we’ll both be convicted together. When the Holy Spirit convicts us and we chose to surrender our ways for the Lord’s ways, then transformation takes place within our hearts. This transformation process causes us to be changed women. Gracious women. Women who reflect their Savior. That sounds like a wonderful pursuit, doesn’t it? Sure, it will hurt our flesh because we’ll have to die to ourselves, but the by-product is absolutely glorious. In last week’s post I wrote about The 7 Truths You Need to Know About God’s Grace. If you haven’t read it yet, please do so because it’s the foundation this series is built on. We can’t call ourselves Christ-followers if we’re not gracious. Every person falls short of perfection and we see each others shortcomings and failures most in a marriage, after all, we’re married to a sinner. Because of this truth, don’t you think we should be most gracious to our husbands? Our men live with us on a daily basis, therefore, they see our failures and shortcomings, too. Walls that have been built? Or dare I say, a marriage devoid of marital intimacy? A great marriage takes work and an abundance of grace. Grace is what sets our marriages apart from the world’s type of marriage. God meant for the union of marriage to be a good thing but some times we don’t know how to handle the strains and pressures of life. When the disappointments, storms, and even the mundane sweep through our homes, sometimes we just don’t know what to do. Our human nature is to place blame and lash out and this attitude is generally dished out to our husbands. But this is not how God wants it. The crux of the Gospel message is Grace, therefore, let’s follow that example so we can change our ways. Grace is for the sinner, the one who messes up and falls short. This describes every person I know. Jesus doesn’t ask us to be perfect, He asks us to follow Him. There’s a difference between pursuing Him and perfection. Which standard do you hold your husband to? Which standard would you like him to hold you to? There have been times in my marriage where I’ve held my husband to a higher standard than what I’ve held myself to, therefore, I acted like a hypocrite. There’s no room for hypocrisy to be a part of our marital union. The minute we allow, accept, and embrace this sin into our marriage, we might as well just open up our front door and invite the Enemy in for tea and crumpets. Be the kind of wife who chooses grace over hypocrisy. Note: You might not know when to extend God’s grace and when to set a boundary in your marriage, so I’ve written this section to help you discern a few things. Grace is extended when the heart attitude of a person is repentant. For example, Jesus knew the heart of the woman who was caught in the act of adultery and then He said to her, “Go and sin no more.” John 8:11 He was gracious to this woman as He offered her grace for her actions. Jesus also knew the motives of the Pharisees. He knew their hearts were hardened towards Him and because of this, He didn’t extend them grace for their actions and attitudes. If you’re married to a man who is living a life of habitual, unrepentant sin, read this post for more guidance. If you’re growing weary because you’re living in a difficult marriage, read this post. 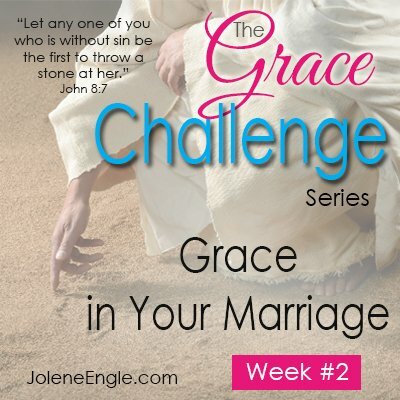 Join me every Wednesday as I go through the Grace Challenge series! Even though you posted “if you are in a difficult marriage…” 2 months ago – I received the email again today and read it this time. The timing was perfect and exactly the encouragement I needed to hear today! You are a blessing! When I was working I would take extra work on when we needed extra money – but he isn’t like that. He thinks his 40 hrs should be enough. So he can watch tv and relax. I know there are strongholds in his life but only the Holy Spirit can transform him. He is a believer. But I have had to walk on eggshells with him our entire marriage. I didn’t mean to pour out my heart it just started to flow. Thank you for your ministry. It gives me hope along with my Savior. I loved hearing how grace is starting to transform your bitter heart! Keep leaning on the Lord in the midst of your storms. He’s with you! I pray that the Lord heals you from the poor state of health and that the Word of God will renew your mind so that you are able to declare that by the stripes of Jesus you were healed. May our Lord Jehovah Jireh, provide for all your needs. May your husband be healed from the pain of all the losses that he has suffered and be made whole so that he can arise again to be the pastor, priest and provider for the family. May the Peace of God that surpasses all understanding be with you now and forever. You write well and long and this could be the beginning of a new career for you to open a new income stream for the family. Be blessed. Adopt a theme song that declares the Word of God and play it until you see victory !!! !in Jesus Name AMEN!!!!!!!!!!!!! Barbara and Jolene thank you for your kind words.Theyy have surely blessed me. The Lord is faithful and a rewarderof them who diligently seek Him. Grace. Such glorious grace. It should change how we love our spouse. My husband has returned home and love how God is using this time to help us to love one another better. Things are oh so good, but that should not stop me from being a part of your grace challenge. So I am all in, friend! First I’d like to say thank you so incredibly much for all the hard work you have put into helping so many others. I, for one, am gathering so much knowledge and strength to aid me in being the Christian wife that my husband needs. I do, however, have a small difficulty. I am trying to follow the Grace Challenge but I’m unable to find week 3. Perhaps is right in front and I’m missing it! 😉 If you could maybe direct me? When I’m clicking “next” it is bringing me to your dating and engaged story. Thanks so much for your website and ministry. I have been a bit bed-bound (nothing serious) and have been so enriched by your grace series. I want to say that I have been dealing with guilt over a former non Christian’s friendship’s ending because of some truthful, yet not graceful words I spoke. Although, I’ve attempted to apologize for my ungraciousness she hasn’t given me the chance. I am learning that I can’t be responsible for her reaction, but I do keep going back to how my words angered her. It was a revelation to read about Jesus’ response to the Pharisesses. I know that I bear a large part of the separation, but I have to accept God’s grace for my part, just as she has to accept my apology (and God’s saving grace) for herself. Thanks, again and God bless you. Loved hearing about your softened heart and how you’ve accepted God’s grace for your part!